Caesarstone quartz surfaces are made to last. 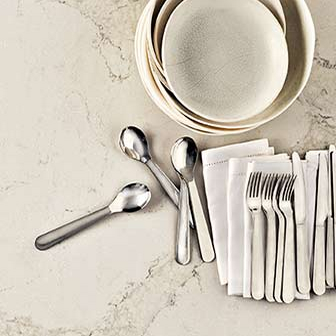 Composed of up to 93% quartz, Caesarstone is durable and low maintenance. We are Caesarstone experts. If you’re in the Ottawa area and want to experience the opulence of Caesarstone quartz, call us. We will guide you in finding the right Caesarstone quartz countertop. The innate strength of quartz is combined with many dashes of pigments and polymers. The result is a durable and breathtaking quartz surface available in many colors and finishes. Non porous hygienic Caesarstone is resistant to stains, cracks, scratches and heat. Caesarstone’s, non-porous surfaces require no sealing, it is scratch resistant and can be easily cleaned with a non-abrasive cleanser. Caesarstone is more heat resistant than most granite, marble and limestone, and is not affected by temperatures lower than 150°C (300°F). Classic, patterned, translucent or comprised of semi-precious stones, Caesarstone has options for every space. "Thank you Martin and Bernadette. My granite countertops look fantastic. I have had so many compliments on the color and the overall look of my kitchen. Martin - you are definitely an expert in transforming a huge slab into a work of art. Many Thanks!" "Capital Stoneworks has excellent service. See Bernadette or Martin. They offer expert installations at unbeatable prices for granite, quartz and glass tiles. The staff is very helpful. They do full kitchens and bathrooms. I have referred dozens of people to them - and everyone raves." "Thank you again to you and your staff for the great work. I will be sure to tell my friends when they are looking for kitchen or bathroom help." "Thank you for all your help with our kitchen. It looks fantastic and the guys were very clean and professional." "I am so happy with my new granite countertop. Thank you for making it a stress free project. Bernadetta was so easy to deal with, so accommodating & helpful and the installation crew was friendly & professional and did a great job! Thanks so much!" "We just had our kitchen renovated by Capital Stoneworks and they did an amazing job. They were quick, clean and wonderful to work with & equal to or less expensive than refinishing. Highly recommend them." "Capital Stoneworks did such a great job for us (at a very reasonable price), that we have used them a couple of times (for us and for clients) and have referred them to at least a dozen (now satisfied) customers. They rock!" "Awesome product... the granite countertop and backsplash made a huge difference, and the workmanship was very quick and tidy. The sink and stainless steel faucet are really high quality. I would highly recommend this company."